Paris, L’OURS, 2016, 328 p.
The disappointments may have been felt that much more keenly because hopes for a socialist future ran so high at the Liberation. Blum was back, and what a heroic figure he was, having faced down Vichy at Riom in 1942 and then survived two years in Nazi concentration camps. The debacle of 1940 had leveled the SFIO, but the rebuilding of the party had begun right away thanks to the initiatives of Daniel Mayer who founded the clandestine Comité d’action socialiste in the unoccupied zone in early 1941. Socialists, moreover, were active in all phases of the Resistance. They distinguished themselves in particular in the ranks of the Resistance Movement Libération-Nord. They headed up over a third of the Resistance’s CDLs (see the joint essay by Fabien Conord, Yves Guillauma, Robert Mencherini, and François Prigent). 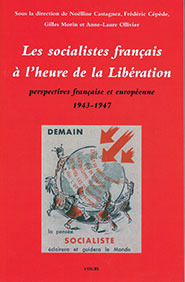 And when the Resistance hammered out a program in March 1944, the so-called “programme du CNR,” socialists were in on the discussion, and no one more than the socialists was attached to the ambitions it enshrined—the creation of a mixed economy with a major nationalized sector and the realization of cradle-to-grave welfare. No wonder De Gaulle invited a number of socialist ministers (André Philip for example) to join his provisional government, and no wonder again that the SFIO, now a “parti de gouvernement” (the phrase is from Alain Bourgounioux’s contribution), came to occupy such a key role in the affairs of the nascent Fourth Republic. At the Liberation, the SFIO seemed to hold nothing but trumps: a distinguished leader, a commendable record of resistance, a compelling vision for the nation’s future, and access to the levers of power. And it should not be thought that the SFIO’s postwar balance sheet was short on achievements. On the matter of reckoning with the past (the subject of Gilles Morin’s essay), the party undertook a serious in-house purge, and on the matter of purges in general, it staked out a middle position between the leniency of the Christian democrats and the severity of the communists. Certain phrases recur throughout the volume: not just “maître de l’heure” and “rendez-vous manqué” but also “légalité républicaine”. The Liberation saw an eruption of disorder, and socialist ministers, like Adrien Tixier at the Interior, tried hard and with success to restore calm and smooth France’s return to a functioning democracy (as Christian Chevandier’s essay demonstrates). The preamble to the Fourth Republic’s constitution guaranteed the basic social rights of all citizens, and this too was a socialist achievement (in partnership with the Christian democrats). Not least of all, socialists had long dreamed of a State takeover of the economy, and the raft of nationalizations at the Liberation was in part a realization of such dreams. It is a significant record, a credit to the SFIO’s commitment to democracy and the public good, but there were plenty of disappointments as well, and that’s the theme these essays hammer home. The SFIO made efforts to rebuild the formidable socialist International of old but with meager results. At home, the Fourth Republic turned out to be a parliamentary regime not so different in constitution and modus operandi from its unloved predecessor, the Third Republic. Socialists had no hand at all in monetary and financial policy-making, and, on the matter of planning—an on again, off again, topic of interest—, Jean Monnet, no socialist, outmaneuvered them. They endorsed the institutions of the new welfare state but did not take a lead in their actual design, which was the work of Pierre Laroque (the subject of Éric Jabbari’s essay). And when they were in charge—as for a period Gaston Defferre was at the Ministry of Information or Tanguy Prigent at the Ministry of Agriculture or Andrée Viénot at the Under-Secretariat of Sports (see respectively the contributions of Anne-Laure Ollivier, Édouard Lynch, and Marion Fontaine)—, they proved over all more able managers than imaginative and innovative ones. Yet, the party’s greatest failing did not relate to matters of policy and statecraft but to party life itself. The SFIO of old had been a parliamentary party, anchored in a bedrock of federations, trade unions, and cooperatives. Marxism was its professed faith, but its guiding star was Jean Jaurès, less a scientific than an ethical socialist. And the party was also republican in conviction, which helped draw to it devotees of republican principle, laïcs, free thinkers and the like. Last of all, the party’s outspoken commitment to peace, internationalism, and social justice proved appealing, not just to workers, but to certain strata of the middle-class as well, school teachers for example, who made up a growing, though not always acknowledged, proportion of socialism’s voters. What the essays in this volume demonstrate is that party militants at the Liberation were more inclined to revive the old model than to update it. It is not that there weren’t partisans of turning the SFIO into a catch all, explicitly cross-class party on the model of the Labour Party in Britain. There were also partisans of expertise, like Philip, who imagined a greater role for the planning-minded in socialist councils of power, indeed, in the councils of power tout court. But they were sidelined, an outcome confirmed at the party conference of 1946, which witnessed the installation of Guy Mollet as party chief and a hard-charging return of marxisant rhetoric to party life (a subject addressed in Agathe Bernier-Monod and Nicolas Patin’s essay as well as in Mathieu Fulla’s). This sealed the party’s fortunes thrice over. The party retained its prophetic, revolutionary voice, but in part for that very reason, it missed a chance to think hard about the new expert-driven, welfare order and how best to run it, which, in a failure of imagination, was left to others. There were also new constituencies to woo in the postwar world: women, who were voting for the first time, and the young, destined in the baby boom era to become ever more numerous, but the party did not position itself to win them over (see Michelle Zancarini-Fournel’s discussion). As for the voters of yesteryear—workers, cooperators, laïcs, school teachers—, the party, its professions of ouvriérisme notwithstanding, held on to its middle-class constituencies but less so to its working-class base. The cooperative movement lost steam in the modernizing postwar world, and when it came to trade-unionists, the SFIO was outbid on its left by a surging Communist party (as demonstrated in essays by Michel Dreyfus and Ismail Ferhat). The mention of the Communist party is a reminder, however, that the SFIO’s postwar problems, such as they were, were not all of its own making. The PCF—the so-called parti des 75,000 fusillés—boasted a record of Resistance sacrifice that was hard to match, not for sure by a Socialist party weighed down by memories of how many of its deputies had voted pleins pouvoirs to Pétain in July 1940 (the theme of Noëlline Castagnez’s article). This helped communists consolidate their authority over the CGT and an ever more militant labor movement. Things might have gone worse for the socialists. In Italy, the siren calls of proletarian unity had divided and weakened the socialist movement there, torn between fusionist tendencies and partisans of autonomy vis-à-vis the PCI. This didn’t happen in France, where socialists knew that the PCF was neither friend nor ally. The SFIO also had to contend with a powerful new current in French public life, Christian democracy. The constitution of the Fourth Republic was the result of a compromise between the SFIO and Christian-democratic MRP, forced to make common cause to stymie the PCF’s electoral momentum and de Gaulle’s presidentialist ambitions (as argued by Isabelle Clavel). And on the international level, the SFIO had to contend with the British Labour Party. Labour had compiled an exemplary record of wartime service; it espoused a reform agenda that promised the British people a brighter future; and in 1945, it was rewarded with an outright majority in parliament. That put Labour in a position, as no other socialist party in Europe, to exercise continental leadership, but it wasn’t interested, leaving the SFIO to advocate for Europe without the requisite authority to make the European cause advance. On sober reflection, then, the SFIO’s balance sheet was very much a mixed one. The party revealed itself lacking in boldness and imagination, and in this connection, more might have been said about the party’s cautious approach to empire, which was to prove an Achilles heal (a point Olivier Wieviorka’s contribution and the editors acknowledge). At the same time, the SFIO was not working in a vacuum, hemmed as it was by others often working at cross-purposes: Labour, the PCF, the MRP and maybe too de Gaulle (who does not play much of a role in the volume). Even so, the SFIO turned out to be a resolute defender of democratic values and over the decades a reliable custodian of the postwar welfarist order, which it had had a hand, albeit not the leading role, in creating. It could have done better, but it could also have done a lot worse, an overall assessment a little more positive than the volume’s but not by much.